The GL883A-10/GL883A-20 is a single/dual ports, 7-in-1 fast-charging port controller that complies with Qualcomm® Quick Charger 3.0™ (abbrev. as QC3.0), MediaTek® PumpExpressPlus 2.0 ™(abbrev. as PE+2.0), Hisilicon® FCP (abbrev. as FCP), Spreadtrum® Fast Charge Protocol (abbrev. as SFCP), USB Battery Charging Specification (abbrev. as BC), Apple® divider charging profile, and Samsung® divider charging profile. QC3.0™ is a proprietary charging technology between USB host (wall charger) and device (handheld device), along with Class A (3.6~12V) and Class B (3.6~20V) capability. With QC3.0™, a handheld device with 2750mAh battery can go from 0% to 80% charge in 35 minutes, which is up to 4x faster than a conventional charger*1. PE+2.0™ is also a proprietary charging technology with output voltage capability from 5V~20V. With PE+2.0™, a handheld device can go from 0% to 75% charge in 30 minutes, which is 2x+ faster than a conventional charger*2. FCP and SFCP are also proprietary charging technologies with output voltage capability from 5V~12V and 5V~20V respectively. USB BC is a public fast-charging specification with output voltage capability at 5V and current up to 1.5A, while the traditional USB 2.0 is 5V@0.5A and USB3.0 is 5V@0.9A. With USB BC, a handheld device can save at most 66% charging time*3. Apple® and Samsung® divider charging profile are both proprietary technologies with output capability at 5V@1A/2A/2.4A and 5V@2A, where a handheld device can saves at most 58% and 50% charging time*3 respectively. 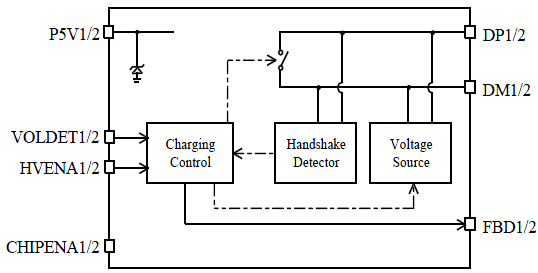 In order to provide the best user experience, the GL883A-10/GL883A-20 will automatically identify these seven fast-charging mechanisms and handshake with the handheld device at the right mode, which already covers more than 95% of handheld devices worldwide. For system heat dissipation or control purposes, there is also a HVENA signal to enable/disable high voltage (> 5V) output. With low standby power consumption, it’s especially suitable for power bank, wall charger and car charger applications in the retail market.